Damask is not a fiber, but a style of weaving, named for Damascus, Syria, where silk and linen were woven in this manner in the early Middle Ages. In damask weaving, patterns are created by longer warp threads on top (satin) for the foreground, and longer woof threads (sateen) for the background. This pattern is reversible, meaning the the negative image appears on the back side of the fabric. This was more commonly done with one color (monochrome). Damask can also be done with multiple colors (polychrome). In either case, the image is created by the pattern of weaving. At the end of the Middle Ages, the art of damask weaving was brought to Italy, then spread across Europe. Many damask fabrics used in the bedding industries are produced in Belgium. Today, most damask weaving is done with Jacquard looms. Invented in 1801 in France, these were controlled by punched paper cards, then by punch-hole paper tape. Now jacquard looms are controlled by digital computers. The most common uses of damask are in tablecloths and draperies, sometimes in clothing. 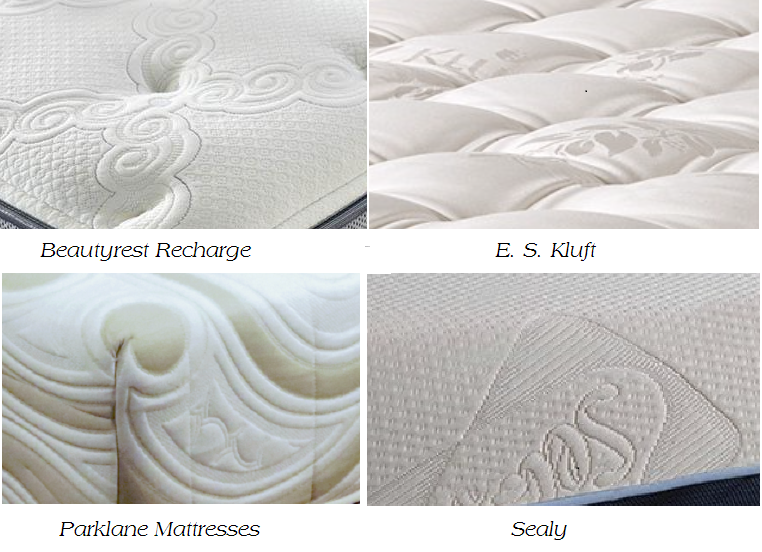 Several bedding manufacturers, for example Simmons Beautyrest, Sealy, E. S. Kluft, and Parklane Mattresses, use damask in the covers of some of their mattresses, often with the name and/or logo of the company repeated in the pattern. Besides weaving, a style of knitting producing the same effect, also called damask, is used on mattresses, especially memory foam, latex, or foam-topped models. Fibers used include cotton, linen, polyester, silk and rayon. This entry was posted on Friday, December 5th, 2014 at 3:52 PM and is filed under beds, fabrics, fabrics, mattress covers, mattresses . You can follow any responses to this entry through the RSS 2.0 feed. You can leave a response, or trackback from your own site.